Today the level of tension in the West Bank is sky-high. 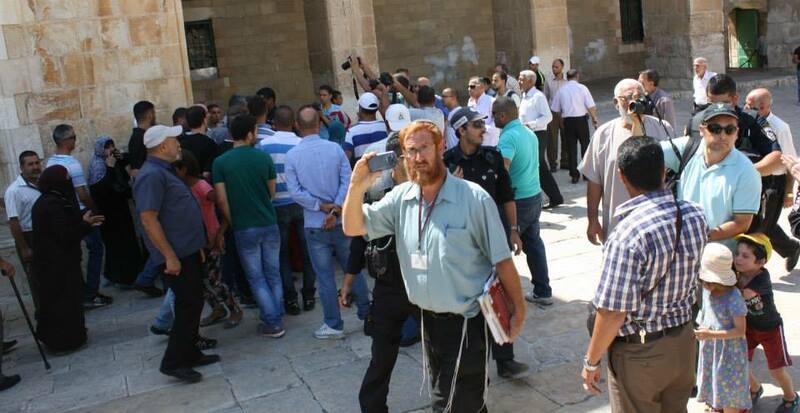 Yesterday one of the holiest Muslim places, Al Aqsa Mosque was closed for the Muslims for the first time since the West Bank was occupied in 1967, after a right-wing hate preacher Rabbi Yehuda Glick was shot at and wounded at a rally on Wednesday. Glick, whom the BBC calls an ‘activist’ campaigning for the Jews to be able to pray in the Haram Sharif/Dome of the Rock compound, was vocal about the plans to destroy the Al-Aqsa mosque and rebuild a Jewish temple in its place. When I was in Al Quds/Jerusalem in August Glick was a frequent visitor to the Haram Sharif compound accompanied by Israeli army and carrying scrolls of scriptures in Hebrew (picture below). On each occasion there were skirmishes between the Israeli occupying army and worshippers whose presence in the are was severely restricted, and particularly so since the Israeli attack on Gaza. The wounding of the hate preacher Glich was followed by the army violence across occupied East Jerusalem and an Israeli military raid on a Silwan in the occupied East Jerusalem, when a Palestinian man Mutaz Hijazi, was assassinated by the Israeli military in his house, based on Israeli claims that he carried out the shooting of Glick. Al Aqsa is opened last night but Muslim men have to be age over 50 to get in. There were clashes reported overnight across the occupied East Jerusalem. IWPS Team will be joining shortly the march in the town of Salfit after the mid-day prayer against the Israeli violence and restrictions in Al Aqsa.